Health services in Balangir, Orissa paralyzed; Why Balangir needs a govt. medical college? BHUBANESWAR: With cholera spreading to more areas in the State, the Centre on Thursday decided to rush a three-member team to Rayagada district, the epicentre of the epidemic, to assess the situation. The team will reach Bhubaneswar tomorrow and proceed to Rayagada. The team includes Dr T Ramamurthy and Dr A Kanungo from the National Institute of Cholera and Enteric Diseases (NICED) and Dr Jagvir Singh from the National Centre for Disease Control (NCDC). The decision to rush a team was taken following a meeting between Kalahandi MP and working president of OPCC Bhakta Charan Das and Union Health Minister Ghulam Nabi Azad in New Delhi today. Das criticised the State Government for ‘inaction’ even though more than 5000 people of the region had perished due to cholera in 1987-88 and more than 500 people had died in 2007. Another working president of OPCC, Lalatendu Bidyadhar Mohapatra, who led team to Rayagada, had also demanded Central intervention. Meanwhile, the State Government has appointed five IAS officers of 2009 batch in Rayagada district to assist the district administration in tackling the disease. They were receiving training in different districts. The Government, however, maintained that the situation is under control. Even though more than 100 people have died of cholera in the district, the Health Department put the toll at only 40. As many as 1311 people of the district had been affected by cholera out of which 1232 have been cured, a release issued here claimed. 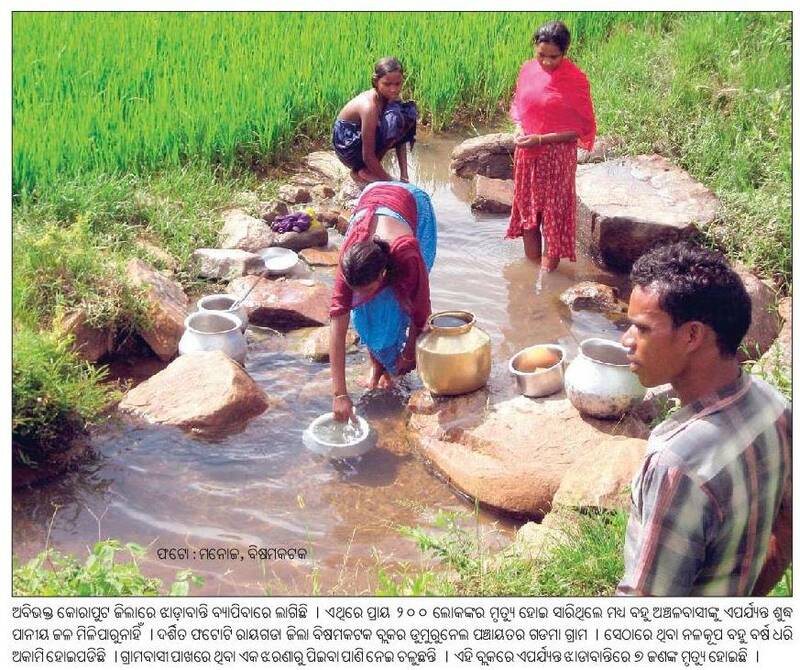 Strangely the Government does not have any figure on cholera and diarrhoea attacks in other districts though reports about these are pouring in from other districts, including Malkangiri, Nabarangpur, Koraput, Gajapati, Ganjam, Kalahandi and Balangir. Diarrhoea has killed at least 136 people in Orissa since January, a health official said Thursday. Around 34 people died in the district of Rayagada and 27 died in its neighbouring Nuapada district, the official said, adding that most of these deaths took place in August. Similarly, ten people each died in Nabrangpur and Keonjhar districts, nine in Ganjam, eight in Malkangiri and four in Kalahandi, he said. ‘The deaths took place mostly due to unhygienic living conditions and consumption of contaminated water as people draw water from streams and nallas for drinking though there are tubewells,’ he said. Rayagada District Collector Nitin Bhanudas Jawale said around 60 diarrhoea patients are undergoing treatment in different hospitals of the district. ‘Medical teams are camping in all vulnerable areas. There has been no death reported since past four-five days from any part of the district,’ he told IANS.